"At our house, it isn't Christmas until the Stollen is here, and Reimer's Marzipan recipe is the best!" 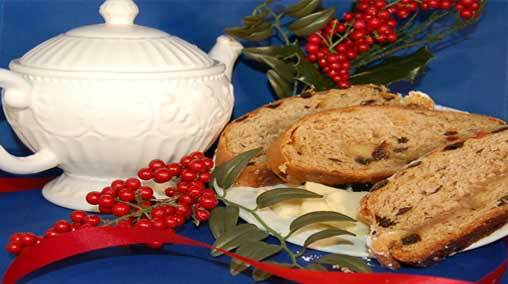 Our traditional German Stollen loaves are made just for the Holiday Season. We use the Reimer's family 1812 Weinacten "Christstollen" Stollen Brot recipe, which is similar to homemade in our Sierra pastries Bakery. We start with sweet yeast dough to which we add our own combination of German Christmas spices, and fruits sourced from around the world! To our Marzipan version we add a half-pound of our almond flavored confection in a ribbon at the center of each loaf. We shape each Stollen loaf by hand, and bake them to an aromatic golden brown. For a richer, dresdner deutsch brot flavor, we then brush our loaves with melted butter, and dust the loaves with a coating of powdered sugar. We gift package the loaves in clear cell-wrap with a festive red satin ribbon for our traditional stollen recipe, or a holiday plaid satin ribbon for our Marzipan version. Our professional shipping department takes care that each loaf is shipped to arrive on time for Christmas giving and in perfect condition. We will also hand write your personal message on our signature gift card.